For one of the most powerful seats in Eastern Washington, the race for U.S. House has very little volume. You’d think the election of the one member of Congress who represents Eastern Washington would be a pretty big deal, at least in Eastern Washington. But ask political observers about the contest for the 5th District’s seat in the U.S. House of Representatives, and they’ll say they barely notice much of a campaign at all: Few yard signs, and even fewer TV ads. 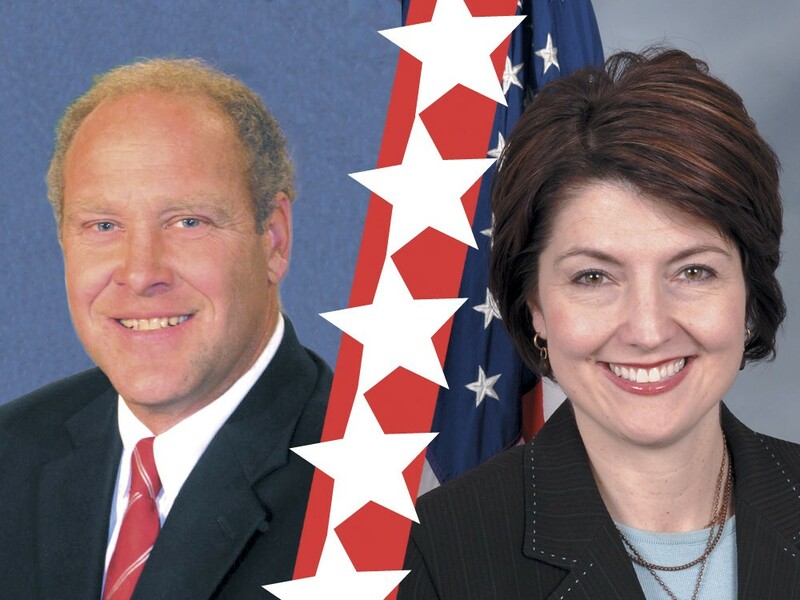 There is a gap — to put it lightly — between Republican incumbent Cathy McMorris Rodgers and Democratic challenger Daryl Romeyn. So if the whir of Romeyn’s political machine sounds quiet, it’s partly because he doesn’t much cash to fuel it. “Forget the word ‘machine,’” Romeyn says. “I don’t have any paid staff. I have myself and three or four key people. That’s it.” If you’re complaining about his low visibility, he says, donate $100 to pay for another TV commercial. While McMorris Rodgers has increased the number of radio and print ads compared to previous campaigns, she isn’t doing any TV ads this year. In the past few months, McMorris Rodgers says she’s been shaking hands all over the district — serving chili at a lentil festival, meeting with Spokane Rock Products and speaking at a Fairchild Air Force Base ribbon-cutting. When it came time to debate Romeyn, however, she said she was too busy. There wasn’t any room on her schedule for the one originally planned for this past Tuesday on KSPS. After some public outcry — including placards reading “Respect voters! Debate Daryl!” — McMorris Rodgers moved her schedule around and decided to debate him after all. Then, it looked as if Romeyn would be the one preventing the debate from happening. Romeyn had scheduled several candidate forums in the moments between when McMorris Rodgers said she wouldn’t attend the debate, and when she said she would after all. But by Monday, Romeyn had sent out an e-mail saying the debate — finally — was back on. If you want to know McMorris Rodgers’ stance on the issues, all you have to do is look at the Republican Party platform. She votes with the GOP 97 percent of the time, according to opencongress.org. (She opposed Bush’s Trouble Asset Relief Program bailout — but so did a slight majority of fellow Republicans.) Only three representatives in the House vote more reliably with the Republican Party. Because of this, Romeyn is glad for the “anti-incumbent” mood so many Democrats are worried about nationally. McMorris Rodgers cites her support for Fairchild Air Force Base and her Seclusion and Restraint legislation — which draws guidelines as to how students can be disciplined — as some of the work she’s accomplished during the last two years. “I really want to be a problem-solver,” McMorris Rodgers says. She also helped develop sunshine.gop.gov to track earmarks and, this year, she joined the Republican proposal to ban earmarks — even though she sponsored 37 earmarks the year before. Romeyn, meanwhile, is hardly the typical Democrat. True, as an organic asparagus farmer, he strongly supports farm subsidies. And he says a major issue he plans to fight for is stopping outsourcing, perhaps by legislating import fees and closing corporate tax loopholes. But he also wants troops out of Afghanistan. He’d be fine with a balanced budget amendment. He supports allowing all non-criminal illegal aliens to become permanent residents, but says we could “close the Mexican border tomorrow if we want to” using National Guard troops, fences, aerial surveillance and dialogue with Mexico. He’s strongly in favor of logging select trees in national forests to create firebreaks. Romeyn was never the Washington State Democrats’ first choice. Their anointed man was Desert Storm veteran Clyde Cordero. But Romeyn, a former TV weatherman with name recognition, won the primary. And the state Democrats never leapt to show their support for Romeyn. The Inlander’s questions about whether the Washington State Democrats specifically endorse Romeyn — and whether they plan to give him any money at all — were sidestepped by their spokesman. There are ways to campaign visibly without much money — but Romeyn hasn’t been very active using free social media either. His website doesn’t have a blog. Since the primary, he’s only posted on Facebook half the number of times McMorris Rodgers has. His last tweet was Aug. 31. But despite the dramatic uphill climb, Romeyn forecasts his chance of winning at 50.1 percent. He says he’s counting on voters looking past party affiliation and at the facts of the election.